Commander Naval Installations Command selected Naval Air Station Whiting Field as the top shore installation in the Navy in its respective category Monday, Jan. 5. The award lauds the top Navy commands at shore for their installation management, program excellence and community outreach. CNIC oversees 11 regions comprising 69 installations worldwide, and the award recognizes a base’s ability to meet CNIC and Department of Defense strategic initiatives. NAS Whiting Field competed in the less than 500 personnel category. Installations are graded across 16 key areas including: facilities management, quality of life, environment, energy, property stewardship, communication, safety and health as well as many other categories. Each entry is limited to a four page write-up of accomplishments plus supporting documentation and photographs. NAS Whiting Field received word of the award Monday afternoon, and new Commanding Officer, Capt. Todd Bahlau quickly praised his team for the accomplishment. “CONGRATULATIONS! Your hard work and dedication was recognized as NAS Whiting Field was awarded 1st Place for the 2015 CNIC Annual Award for Installation Excellence (small category). Bravo-Zulu for a job exceptionally well done” he said. The award comes with $170,000 award which the base can use to improve existing facilities. However, while NAS Whiting Field receives the recognition, the honor couldn’t be achieved without a community that supports and partners with the air station to accomplish the mission. The award nomination package included citations emphasizing partnerships with Santa Rosa County toward achieving “Safe Community” designation for the county, encroachment partnering to secure property around the base to prevent incompatible development, incorporating 16 Military Family Life Counselors in area schools creating the most robust program in the country, hosting the Military Appreciation Month picnic for local military and retirees, and much, much more. “We truly benefit from one of the most supportive military areas in the country,” Bahlau stated. “We know how fortunate we are. This recognition doesn’t come to NAS Whiting Field without their help, and we are grateful to be a part of this exceptional community. NAS Whiting Field has been knocking on the door the past couple of years finishing second in Navy Region Southeast for two consecutive years before earning the region’s nomination in October for this year’s competition. The award comes at an appropriate time as it completes a sweep of the Navy-wide awards for Pensacola area Navy bases. 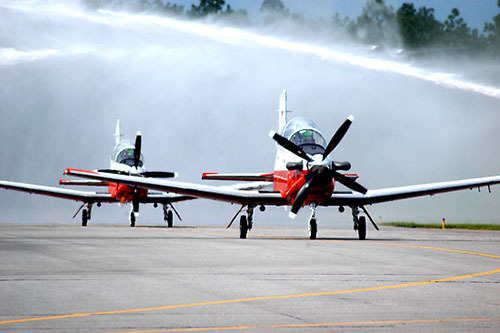 NAS Pensacola earned top honors for entry in the category for more than 500 personnel. “It is truly an honor to receive this recognition, and we are determined to continue providing the best support to the Navy and the Nation as we train the best aviators in the world.” Bahlau said.